Gold! One of the most galvanizing events in California history occurred on January 24,1848. John Sutter had a huge land grant at the junction of the American and Sacramento Rivers. 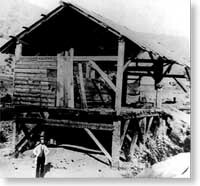 He hired James Marshall to build a sawmill at a place the Maidu Indians called Coloma. On that cold January morning, Marshall spotted something shining up from the millrace. He picked up several pieces. Were these small nuggets really gold? He tested one by smashing it between two rocks. It flattened and didn't shatter. 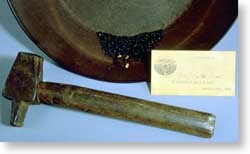 The woman who cooked for the construction crew tested another in a pot of lye. It was gold! With this chance discovery of a few, small gold nuggets on the American River, everything changed in California. Sutter had hoped to keep the news of this discovery quiet while completing his construction. But there was no containing gold fever!